A beautiful salmon packaged inside a crispy puff pastry crust. 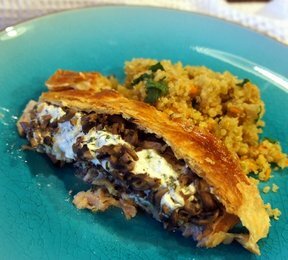 Inside the salmon is tucked away with a garlic-herb spread and mushrooms. Perfect for entertaining guests or that one special guest. Preheat oven to 375 degrees F. Line a rimmed baking sheet with parchment paper. In a large skillet over medium heat, heat olive oil and mushrooms until browned. Season with salt and pepper, and cool. Halve salmon through the middle into 2 pieces of equal thickness. Season with salt and pepper. In a small bowl, combine cream cheese, herbs, lemon zest, garlic, salt and pepper. Cut rolled dough into 2 pieces across the center. Place 1 half sheet of dough on the baking sheet and center salmon on dough. 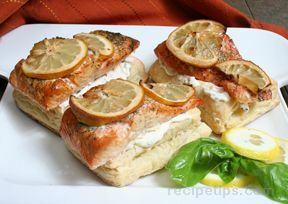 Spread half of the cream cheese mixture on top of the salmon filet and top with other half of the salmon. Top with remaining cream cheese mixture and the cooled mushrooms. Set pastry top in place and seal edges. Lightly score with cross hatch pattern on angle, being careful not to cut through dough. Combine egg with a splash of water and beat. 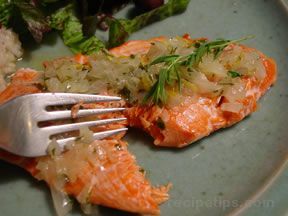 Brush with egg wash and bake 35-30 minutes to cook salmon through and until the dough is puffed and brown. "Oh, my! This is delicious. 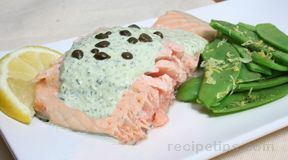 The creamy herb mixture and the mushrooms along with the tender salmon and the crisp crust. Wow! I made it for my mom and it was easy to make yet elegant and impressive."